2% on Reloads, 3% on All Purchases! Use of this card indicates your acceptance to all terms and conditions. 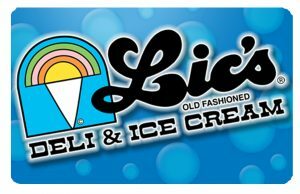 You may use this card only at Lic’s locations. Cannot be used for purchases of gift certificates or gift cards. No expiration dates or service fees. Protect this card like cash. For customers already holding a gift card, can they participate? For customers already holding a gift card, can they reload their card and get cash back? What percentage cash back is given? 2% ON RELOADS, 3% ON ALL PURCHASES. Can customers buy gift certificates or gift cards with their gift card? Do customers receive cash back when they purchase a new gift card? What is the minimum dollar amount that can be loaded on a NEW gift card? What is the minimum dollar amount that can be loaded when RELOADING a gift card? Can customer pay from their phone in the mps.bz/m/lics website? Can customers load the gift cards into their I phone wallet? NOT AT THIS TIME, OUR CURRENT CARDS DO NOT HAVE THE QR CODE THAT IS REQUIRED FOR IPHONE WALLET. ONCE WE GET NEW CARDS, THEY WILL HAVE THE QR CODE ON THEM. Why should customer’s download STOCARD APP? IT IS EASIER TO PAY FROM THAT APP THAN TO HAVE TO LOG INTO THE WEBSITE.